I’m in the middle of producing my next Classic Pattern Design course - Make an Indian Floral pattern, but there are a few weeks until I’m ready to press publish. So I thought it would be fun to throw a challenge for the first one - about creating a Toile de Jouy pattern - in the meantime. And what will the winner get? 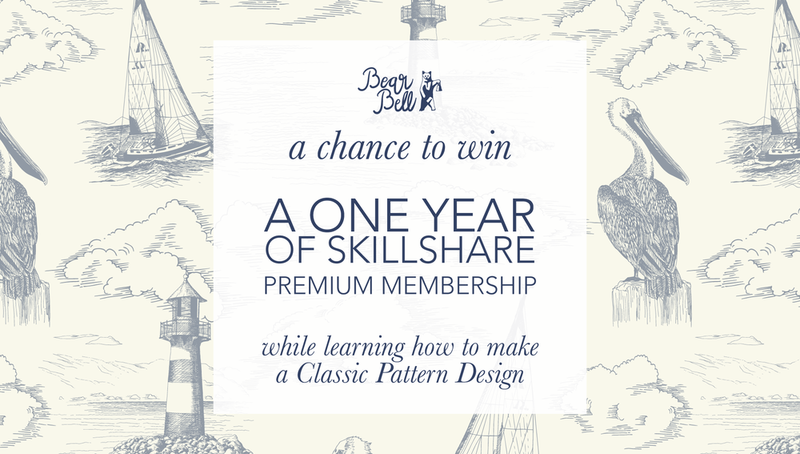 A one year Skillshare premium membership! 1) If you're not a Skillshare member already, click this link that will take you to a page where you can create a 2 month free trial Skillshare account. No strings attached. 4) Create a project in the project section of this course and upload an image of your finished pattern. It’s great if you also share a bit about your process, check out the class project description for some tips on what to include in your project. 4) Follow me on Instagram: @bearbellproductions and please include your IG-names in you project description as well so I can follow you too. I’ll pick the winner from completed projects and that has that something special, an x-factor that just stands out. Post your project by the 25 of November and I’ll announce the winner on Instagram and Skillshare on November 30th. Hope to see you in class and the patterns you'll come up with!